I had a very spiritually turbulent youth. Instinctively I felt the presence of God in the world, but I had no direction in life. It didn’t ever occur to me to pray in order to find the truth. I studied some teachings in books as a scholar rather than a believer, and I “got mixed up” in other teachings. The results of these “adventures” were my spiritual experience and a moral right to judge the spiritual phenomena I lived through. Perhaps the main experience before my conversion to Christianity was meditation. In intellectual circles meditation has become a synonym for prayer, while there is a fundamental difference between them. I first encountered meditation as a boy during karate lessons. When we got awfully tired after practice, our coach (or “sensei”) would seat us on the floor and teach us meditation to relax our bodies. We would obediently close our eyes, imagining green grass, the sun, waterfalls, and birdsong. We would relax for one to two minutes in this way, becoming one with imaginary nature, and, refreshed, continued our practice. This was my first, but, alas, not last experience of meditation. This type of meditation is the most “harmless” one, if we can use this word with regard to meditation. Its aim is focusing the mind on one particular thing (in this case to help you relax your muscles) and not connecting with the spiritual realm. There are a wide variety of meditative techniques, yet their basic principles are the same. By diverting the flow of thoughts on an imaginary object one concentrates on it, relaxes and falls into a trance. Meditative practices vary depending on a psychic’s aim. While during karate lessons mild relaxation was enough, occult sects pursue other objects. In outward appearance prayer and meditation look very similar: both require focused attention, withdrawal, and collection. 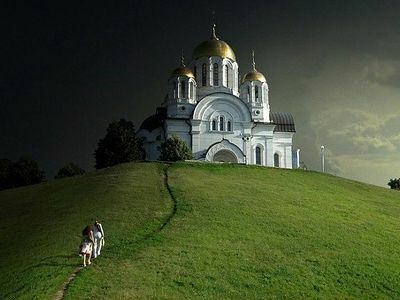 However, Orthodox prayer is very different from meditation in terms of technique and purpose. And I have had a good reason to put special emphasis on the word “Orthodox”. The fact is that today only the prayer of the Orthodox Church is the genuine practice of prayer as taught by the great Holy Fathers, untainted by any heterodox influences. Let us take Francis of Assisi who desired to experience Christ’s Passion on the Cross. But while excessively emotional prayers in the Roman Church were sporadic for several centuries after the Great Schism, from the time of Ignatius Loyola (the sixteenth century), the founder of the Society of Jesus (the Jesuits), indulging in fantasies and dreams became an integral part of Catholic spirituality. As a matter of fact, the life of Ignatius Loyola can be compared with a sentimental religious novel; not without reason is it believed that Loyola was the prototype of Don Quixote—the main character of the famous novel with the same name by Miguel de Cervantes. Loyola’s Spiritual Exercises are a combination of meditative techniques “to attain Divine love”. The Exercises are divided into four parts, corresponding to four weeks, in which believers are expected to remember the major events in the Bible. The first part is devoted to the Fall; the second one is devoted to the Incarnation and life of Christ on the earth; the third one to the Crucifixion and Burial of Christ; and the fourth one to the Glorious Resurrection of the Savior. The key words in his ordered scheme of meditations are “imagine”, “fancy”, “sense”. He stressed the need for “prayerfully” imagining the events and places from the Holy Scriptures, getting a mental picture of the New Testament characters, conversing with them, and touching the objects in one’s mind. Omitting other suggestions of Loyola, we will point out that the techniques in The Spiritual Exercises are typical meditations. Loyola taught to recite the Lord’s Prayer for hours with imagination and contemplate each verse. In essence, the practice of occultists is only slightly different. The only difference is that occultists imagine chakras rather than events of the New Testament, and “travel” to astral the realm and Shambala [a mythical kingdom in Hinduism and Tibetan Buddhist tradition]. To put it in contemporary terms, it is a virtual tour of spiritual worlds in both cases. Indeed, holding images in one’s mind hinders prayer, moreover in a threefold manner. Firstly, the mental generation of images requires a lot of attention, so one can’t focus on the words of prayer. Little by little the dividing line between reality and the realm of illusions becomes indistinct, and that person can no longer distinguish the scenes that are the product of his imagination from those sent to him “from heaven”. Secondly, sooner or later he arrives at the conclusion that the images he sees during prayer are sent to him by God. That is the second impediment to his communion with the Creator. Thus, instead of addressing the Heavenly Father with a penitential monologue, he invents a “dialogue” for himself. Thirdly, seeing that the time is ripe for their interference, demons join this “dialogue”. They appear to him under the guise of saints, angels, and even Christ and the Holy Theotokos! This leads to the ruin of the ascetic’s soul. That is why the Church Fathers forbade the use of mental imagery during prayer. However, a meditation practitioner may argue and say that some types of meditation don’t involve visualization. This is the so-called “experiencing void”—that is, a meditative practice where you focus on the absence of thoughts. According to meditation gurus, in the long-term practice of “non-thinking”, all kinds of thoughts and desires disappear, as does the awareness of our ego; ultimately, respiration almost disappears, you get into a state of deep calm, a light illumines your inner consciousness, and you enter into a state of inexpressible bliss. I hope it is obvious for every practicing Orthodox Christian that this spiritual “light” outside Christ is of demonic nature. This type of meditation has nothing in common with Orthodox prayer either. The “non-imaginativeness” of Orthodox prayer is not about diluting the believer’s personality; we avoid mental imagery during prayer not for the “void”, but for Christ. We “gather” our mind into one point (a focus, an eye), and this eye gazes at the words of prayer as if through a magnifying glass, becoming absorbed in them. But this is not the only difference between Orthodox prayer and any type of meditation. Another fundamental difference is repentance. “Repentance begets prayer, and abundant repentance in born of it.” These words of St. Ignatius (Brianchaninov) should become the motto of all who practice Orthodox prayer. Repentance is the nerve of Orthodoxy. It is neither self-condemnation nor excessive self-criticism for our sins. Repentance produces at the same time both grief and joy—the joy of our deliverance from sin accomplished by Christ. Feeling regret for one’s sins without hope causes death and despair. It is only under the influence of Christian hope for forgiveness and deliverance from sin that one’s remorse for sins can grow into true repentance. No type of meditation is imbued with the spirit of contrition. Meditation is an unauthorized entry into the spiritual world—out of curiosity, for “enlightenment”, in short – for anything but repentance. We can trace the origins of meditation in Gnostic sects’ rites, mysteries, and initiations. In Gnosticism, knowledge is the key condition of spiritual development. The more “initiated” you become, the more “enlightened” you also become. “The Russian intelligentsia adopted a whole system of mystical excitation and the Western mystical-utopian tradition, and immersed itself in the life of post-Reformation mysticism,” Florovsky wrote in his Paths of Russian Theology. “In effect, in dogmatic terms freemasonry meant the revival of Platonized Gnosticism that had been renewed in the period of the Renaissance” (Paths of Russian Theology, IV, 6). This Gnostic poison of meditation has remained in the worldviews of intellectuals since then despite the change of various dominant philosophical and political systems. Many of the intellectuals and well-educated people whom I’ve met in my life were more favorably disposed towards meditation than towards prayer. They associate meditation with spiritual liberation, but when it comes to Orthodox prayer and the Church, they associate them with stagnation, if not enslavement. The reason is the following: our path towards communion with God in the Orthodox Church presupposes all-out daily efforts to improve ourselves, ascetic practices, self-denial, humility, and the transformation of our souls. Quite the contrary, meditation offers entry into “the holy of holies” as soon as possible without any physical or mental inconvenience for one’s self. 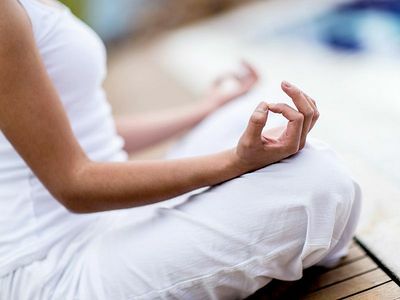 The atmosphere of exclusiveness and chosenness reigns in the groups offering meditation exercises. Such people have a patronizing attitude towards others, whom they regard as illiterate plebians. While the Pharisee from the parable in the Gospel observed some outward regulations (fasting, charity), these mystics don’t stint themselves of anything even outwardly. This is their credo: “you can do whatever you want” because, in their view, it is not moral purity, but a repertoire of magical knowledge that helps you grow closer to God. This is the typical sectarian psychology, albeit these groups don’t pose as religious ones. Meditation is the instrument of an arrogant person who has plunged into mysticism. We are sure that St. Ignatius (Brianchaninov) would have agreed readily with these words: “Pride begets meditation, and abundant pride is born of it”. He who seeks the Truth (and doesn’t pursue selfish, momentary interests) will sooner or later choose penitential prayer and will never be able to quench his spiritual thirst with the surrogate of meditation. Sometimes the journey to the Light takes people through years of serving dark forces. This is what happened to Elena Smirnova. She used to practice witchcraft and esoteric arts, and summon evil spirits.